I saw this recipe back in November in Bon Appetit for after Thanksgiving indulgences and it looked like heaven to me. I made it on our vacation over the holidays and totally loved it! But I made it a little different and added my own twist and process on making it. I love Kimchi and have made it at home several times, it’s actually pretty easy. It takes a bit of time and attention to cleanliness but so worth it. Anything with kimchi and I’ll look at the recipe for sure. It’s so good for us and our tummy flora. It has probiotics from the fermentation. I did some research on the benefits of cooking kimchi, and I’m still on the fence but I’ll share anyhow. I read that if kimchi is cooked, it loses it’s health benefits. That may or may not be true, so I covered my bases with this recipe. I added some kimchi while cooking to give the broth a deeper flavor. I also served the soup with raw fresh kimchi for the proven health benefits of the probiotics and fermentation. It was worth doing both. The broth is Winter cold weather satisfying and the garnishes give it a fresh finish, I will be adding this to my soup repertoire for sure! 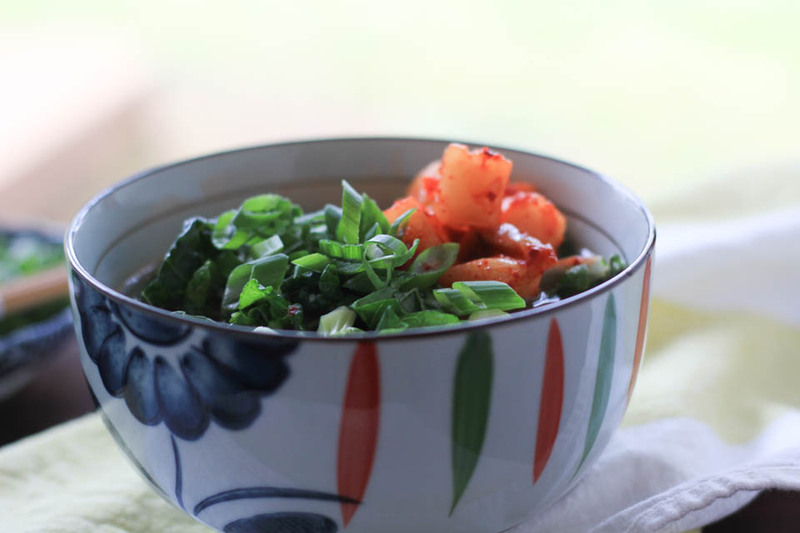 I bought a daikon radish kimchi from a local maker for this recipe. Like I said, I’ve made it at home, but I have also bought it from Korean restaurants. Either way, it’s a good ingredient to have in the fridge to add to soups, noodle dishes, or eat a pile with rice for a nutritional ingredient. This soup can easily be made gluten free and vegan, so that is a bonus as well. It’s such a beautiful and simple soup to make. There are several ingredients, but the process comes together quickly and is worth every moment. In a large pot or Dutch oven, add oil over medium low heat. Once shimmering, add sliced onions, cook until caramelized for 15 minutes, only stir once. Add garlic and ginger, stir until fragrant, about 2 minutes. Add stock, bring to a boil over medium high heat, reduce to a simmer, add 2 tablespoons kimchi juice, 1 cup kimchi. Cook on low heat for 40 minutes covered. 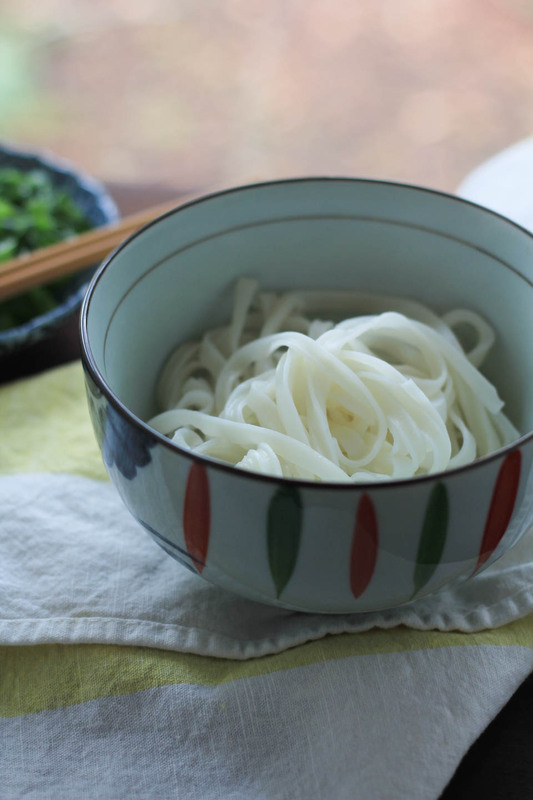 While it cooks, cook rice noodles and poached eggs. 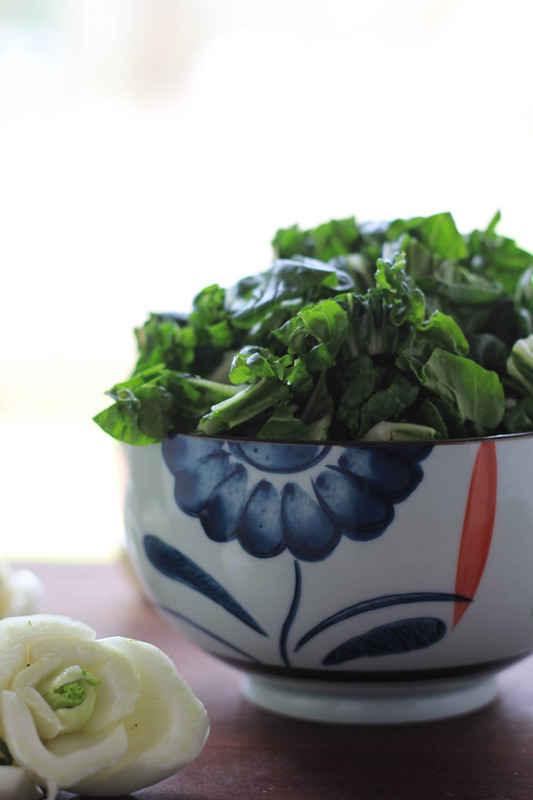 Turn off heat, add bok choy, stir to combine. Taste for seasoning. Add fine sea salt if necessary. Divide rice noodles among 4-6 bowls. Ladle soup and bok choy over noodles. Serve immediately with kimchi, green onions, and soy sauce. Store for leftovers- Keep rice noodle separate from the soup broth, store in airtight containers for up to 3 days. Inspired and adapted from Bon Appetit. I’ve been obsessed with kimchi soup recently! We buy a huge 5 gallon jug of kimchi, so I’m always looking for new ways to use it. Soup is also a perfect way to use up any kimchi that’s gone a bit too sour! What?!!!! That is so super awesome. I love it in soups when it’s gotten a bit strong too. And in rice, yum. Sounds great! 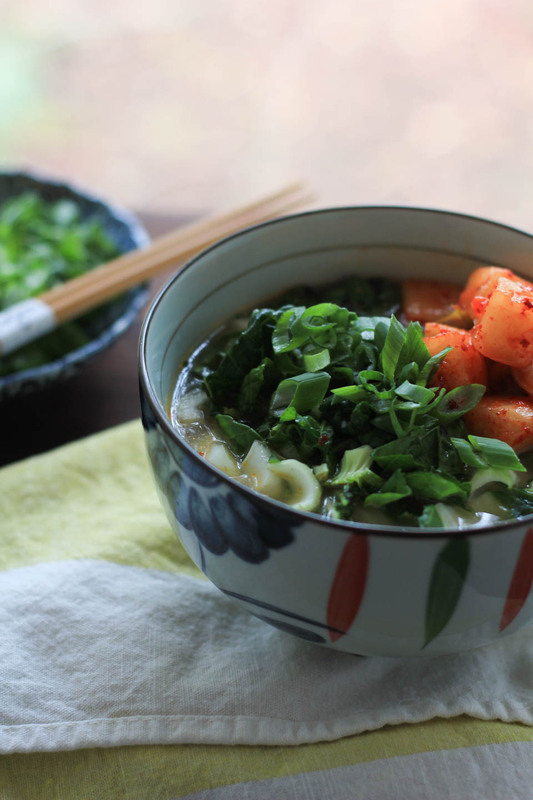 I’ve only had raw kimchee, but putting it in soup is something I need to try! What a terrific idea, I’m loving everything about this soup! My fiancé loves kimchi so much, he would adore this soup!! We always have kimchi in the cupboard, so I need to make this ASAP! All I can say is YES, YES, YES to this soup! I love Korean food and adore kimchi in anything! Wish I could reach through the screen!